I'm surprised the meaning of those numbers are still a mystery, especially while every Omega repairer should know what they indicate. Calibers having a number in the Omega logo are prepaired for both flat and domed dials: 1 for (almost) flat, 2 for domed and 3 for high domed dials. For ordering parts carrying the hour, minute or second hand you need to indicate this number, otherwise you risk to receive replacements which are too short or too long. Upgrades of Omega calibers are indicated by a code starting with a 'T' and followed by a digit 1, 2 or 3. Hi Robert, and thanks for your comments. 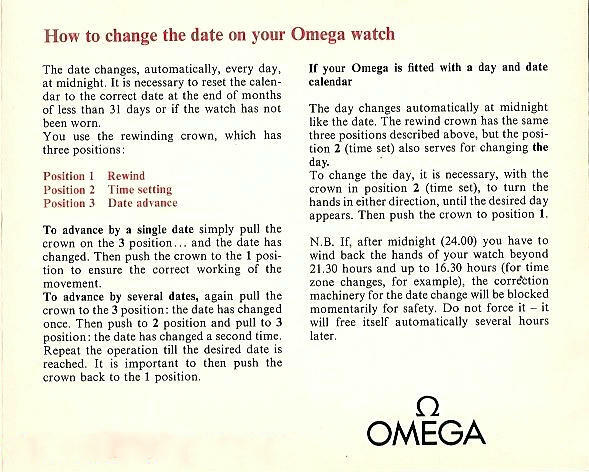 I am aware that on earlier Omegas (at least in the 1950s) the numbers do indeed indicate the need to consider the height of the dial when ordering parts. I have seen reference to 1,2 and 3 on parts bulletins. However with Constellations, for example, with calibre 354 where both domed dials and pie pans were used there is no number stamped on the movement. Also for cal 561, for example, there does not appear any consistency that I can see with domed or pie pan dials - some domed dial original models had the number 1 stamped while others have not, and some piepans have while others have not. Perhaps we can continue this conversation by email - as I am very keen to get to the bottom of this issue. Click on the about me and you will see an email click through. Another thing I noticed is the little circle stamped on the rotor at some movements. As I could observe from studying photos of different movements, it seems that most 564 calibers do have circles wile 561s do not. I found also exceptions possibly because of changing the rotor in time. I also found pictures of some rotors more crude, without the beveling on the edges, but I tend to think those are non original parts installed later. I couldn't find a rule for calibers 551 and 751 however. Another interesting detail I observed in at the end of the swan neck spring at the regulator. At some movements there is a rounded end and at others the end is simple. I couldn't find a rule for this. By the way, thank you for your very informative site! Yes, one explanation I heard was that the O indicated original factory rotor and not a replacement but that didnt make much sense overall. Change of some design aspects of the swan neck were cosmetic and came in later movements I believe. Maybe after issuing the 564 they decided that the O should appear to indicate originality. I saw several 561 and 564 movement pictures and the exceptions where when there were also other color variations between the rotor and the other parts and this explains them by being changed later. Was cal 561 used in the Constellation or only the earlier cal 551? i have an omega constellation chronometer with a 562 caliber with a number one etch inside the omega logo..
swiss made.. tben below it, 18k 0.750.
then below it is 61, and below is 14381 2 and below it appears to be a key, with no.4 inside folled by SC. it also seems to have a triangular stamp to shape like a head facing 0.750 mark. now i am wondering the dial says omega automatic chronometer constellation, but i can't seen to find a 562 fitted in the case with this kind of case.. will u please enlighten me about my watch. I need to ask a couple of questions before I can accurately answer your question. Does the bridge from which the rotor turns have "Adjusted to 5 (five) positions and temperature" stamped on it? Secondly, is your watch a date mode or without date? Answers to these questions will allow you to determine if the movement has been tampered with. The model 14381 should be powered by a calibre 551. What I suspect has happened to your watch is that the train bridge, which carries the movement identification and serial number, has been swapped out owing the damage or wear to the jewels. the watch is a date mode sir . it doesn't have the "Adjusted to 5 (five) positions and temperature" sir..
Ah. Well what we are seeing here is a movement swap. An non-chronometer calibre 562 has been placed in a case that should house a calibre 551 chronometer movement. The cal 562 is probably from a Seamaster or Geneve. Thus the watch is only worth gold value, sadly.